Over the past couple weeks, we have found that both augmented reality (AR) and virtual reality (VR), are assets throughout the supply chain. With new developments, increased availability, and reduced costs, they are becoming the technologies to key an eye out for. Businesses have access to a lot more data, and they are using this data, combined with these emerging technologies, to improve the challenging aspects of running a business. The fact that technology can learn, and can now communicate machine-to-machine (M2M) and machine-to-humans (M2H), has provided the opportunity to improve reoccurring issues throughout the supply chain. 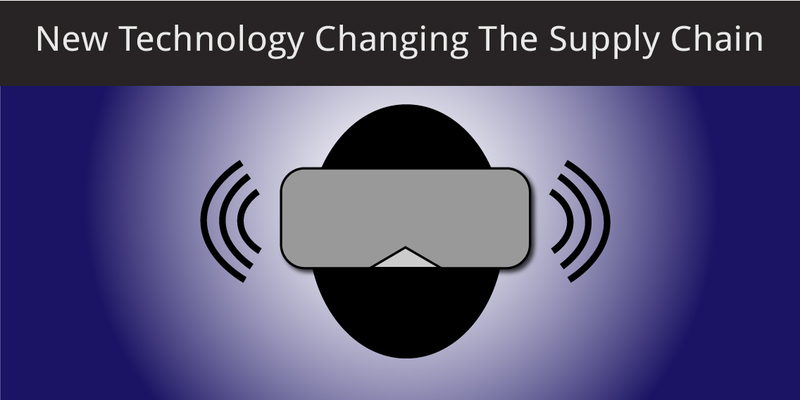 This is a closer look at how supply chains are transforming with AR and VR technologies. As we have discovered, AR is an interactive experience of a real-world environment, which enhances natural environments. Objects from the real-world are computer generated, and then shown to the viewer in a digital world. AR helps businesses’ by increasing the speed and accuracy of retrieving data. AR technology is built-in to easily locate products, and helps to simplify and improve workflow processes. Becoming more efficient reduces backorders and errors. Overall, AR can benefit your business with pick and packing, maintenance, the last mile delivery, and procurement. Similarly, we found that VR is also an interactive computer-generated experience that takes place in a simulated environment. This allows you to interact in environments in a real physical way. VR helps by boosting customer service, reducing operating costs, helping with security and regulations, and improving the overall day-to-day processes. Some main benefits businesses experience when using VR are improved communication, the collection of important data, showcasing products and enhancing pay processes, and improving supplier relationships and customer service. AR? VR? What’s the Difference? All businesses want to have efficient processes in their warehouses, as well as excellent customer service. Using either one of these tools allows users to get a real-time look into their day-to-day processes to ensure they are running as planned. AR facilitates the order picking process. Users can see where items should fit on the cart, what items need to be picked, as well as the most efficient route through the warehouse. This is a huge improvement over using a piece of paper or handheld scanners. Using this technology will reduce errors, increase speed, and decrease rigorous job training. You will also have happy customers because they are getting what they ordered – on time! VR helps make the delivery process safe and efficient. Drivers are repetitively confirming where an item is on their truck and where to deliver it. With VR technology, it can make this process much better. It can inform the drivers how heavy the package is, what its contents are, whether it’s fragile or not, and where it needs to be delivered. In addition, VR can help train employees on new equipment or dangerous devices, without putting them in danger. This allows employees to interact and experience situations in a simulated environment. This also works for customers. You can offer your customers the ability to walk through your stores and look at products, without being there. Both AR and VR have individual benefits, as well as benefits when used together. In 2012, IKEA released an app that allowed customer to view items using VR technology. They have recently updated that app which allows customers to select an item and view it in any room, by using their phones camera. Eolian applications use AR and VR to reduce human error rates by creating simulations of dangerous tasks, and Virtualitics provides data visualization in VR and AR environments. Other companies are using headsets so customer can browse their aisles. There are many possibilities that complement the application of AR and VR. For example, Identity detection would flag images or people for a security guard. For retail, virtual showrooms could enhance product selection for customers. By using other components, it could allow people to easily locate goods. AR and VR technology is spreading quickly. It is changing the way customers and employees interact with the world and services. There are many ways that AR and VR can improve your supply chains, which will keep you ahead of your competitors. The benefits of using AR and VR throughout your supply chain are endless. Can AR and VR transform your supply chain? This concludes our blog series of New Technologies Changing the Supply Chain. If you want information on how inventory management can benefit your business, request a demo today!